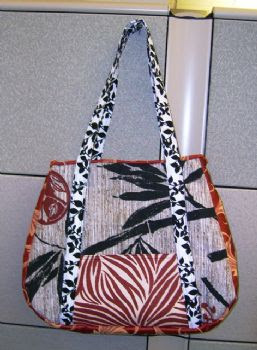 Lately I have been getting orders and making some large bags like you see below. Now that I have completed my last bag I am free to work on other things. One item I wanted to make was for my husband. His job is to fix things and yes, he has tool bags and such but he also needs to take other things into the job with him. I told him I would make him a "manly" bag when I got done with my purse orders. You see, he's retired from the US Marine Corps and he has certain standards to live up to. No Hello Kitty for him! Anyway, I picked out the material and pattern. Here's what I came up with. I made the tote out of camouflage material, here are some other pictures. It didn't really take that long to make either. There are outside pockets on both sides too. All in all - it's a keeper!